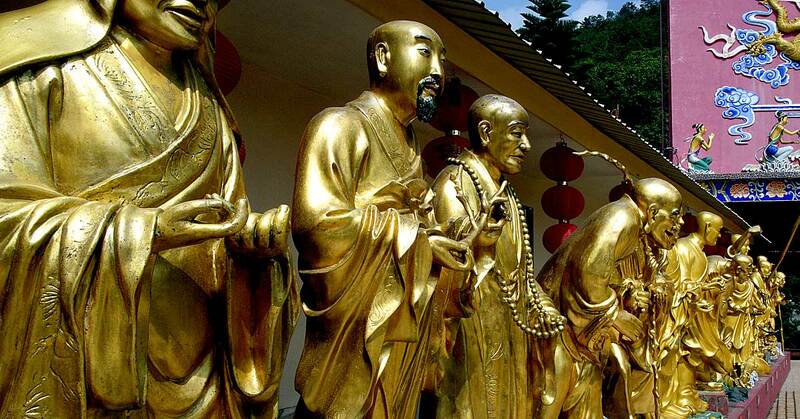 The Ten Thousand Buddhas Monastery or Man Fat Sze (萬佛寺) is one of the oldest tourist attractions in Hong Kong. 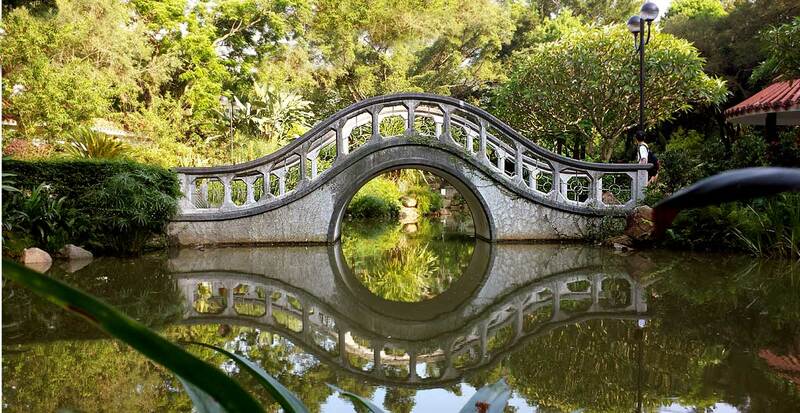 Located in the new territories in Sha Tinc it is a fantastic place to visit and take a picture. Being in Sha Tin though it is quite a long way out and probably not worth visit on its own unless you also have an interest in one of the nearby attractions such as the race course, the bee farm or the Hong Kong Heritage Museum. Despite the official name, it isn’t a monastery, as no monks are living there, unlike the Po Lin monastery beside the Big Buddha on Lantau. Instead, it is a temple complex with many shrines, pavilions and buddhist related artworks, particular statues. The land of the monastery was donated by a local businessman who was a devout Buddhist and started the project with a respected Buddhist monk, whose mortal remains are still on display there. The monastery is currently operated by laypersons. Most people visit to see the vast walls inside the Great Hall lined with small statues of the Buddha, but that isn’t all. Outside on the patios, there are also many pavilions with free-standing statues. If you were to count them all up they say it is more like twelve thousand than 10 thousand! 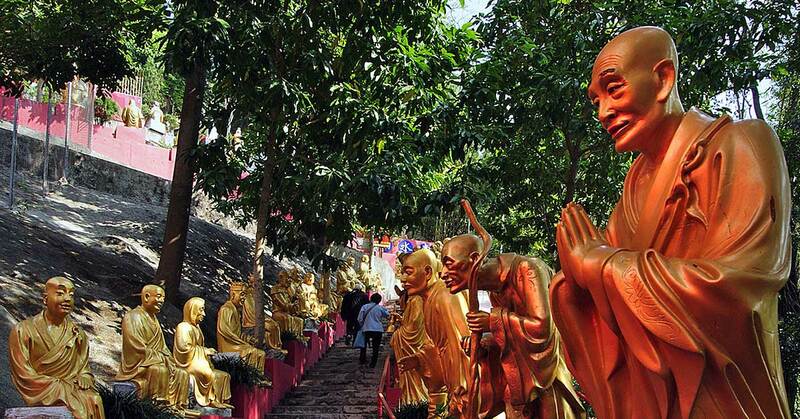 Stairs leading to the monastery are lined with golden Buddhas, or more accurately Arhat statues which are very popular subjects for photography. 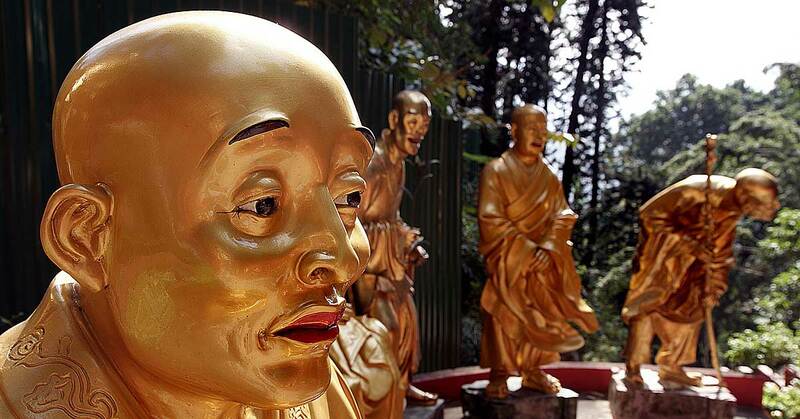 Read on to learn more about the 10K Buddha Monastery. Visitors to Hong Kong who need help in getting to this somewhat out of the way attraction, as well as what else is worth visiting nearby. Expatriates in Hong Kong who may have heard of it but are not sure what they will find there. Those researching Buddhism or temples in Hong Kong or in general, quite possibly for their homework, who want background information. You know who you are! Make sure you quote and reference your primary sources correctly! Vegetarians or vegans who want to know if the food there is worth the hike. Instructions on getting there from Central or TST, including details of the walk from the MTR station either by the recommended route or the scenic path through the village. Details of what you can find at the monastery from the arhat statues to the vegetarian restaurant to the layout of pavilions and halls. Background of the development of the monastery, the way it got the strange name and more. 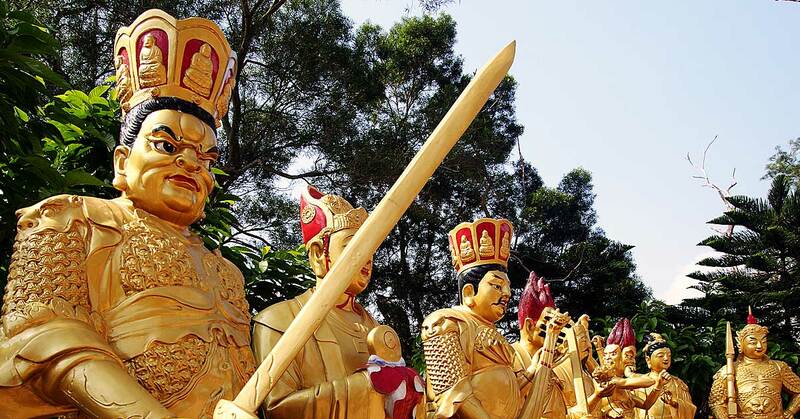 Located near the new town of Shatin the monastery is easy to reach by public transport. However, the last few minutes of the trip are complicated and it needs some attention to find the small path that leads to the monastery. The MTR is the best way to go from Central. If you are new to HK then read the MTR usage guide first. 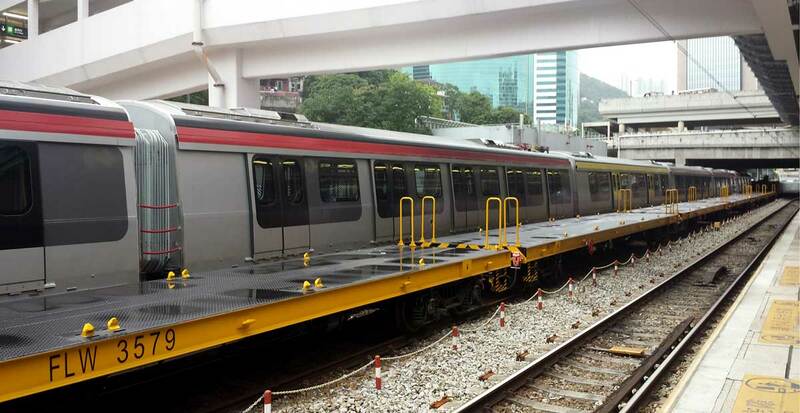 Change at Kowloon Tong to the East Rail Line – this is a surface level train. Travel overland to Sha Tin Station and alight there. Follow the walking instructions below to get from the station to the monastery. To reach the Ten Thousand Buddhas Monastery from Tsim Sha Tsui use the MTR, but use the above ground West Rail line to get more of a view of the city and the countryside as you go. It means fewer changes as well. Start from East Tsim Sha Tsui MTR station (aka East TST MTR), take care that you are in the east station. If you start in the other TST station then follow the signs to use the underground walkways to reach the East station from the regular TST station. Take the West Rail Line one stop to Hung Hom. This is the “wrong way”, as in it is travelling south when you want to go north, but takes you to the correct station where you will change to the best train. At Hung Hom transfer to the East Real Line going north towards Sheung Shui. Any train will do on this line as the different destinations are way beyond Sha Tin. Travel four stops to Sha Tin Station and then follow the walking instructions below. 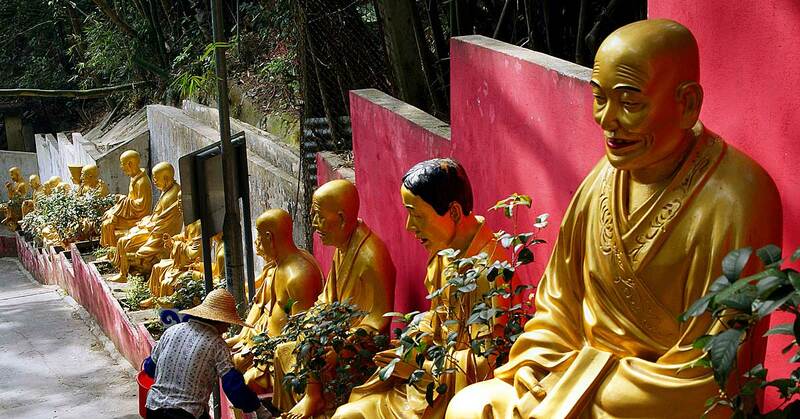 To reach the Ten Thousand Buddhas Monastery from the Sha Tin station is only a ten-minute easy walk. At least it is easy to the foot of the steps to the monastery. Going up the hillside is quite a climb whichever route you take. How long it takes you to climb the 431 steps may depend on your fitness, and how many times you stop to take pictures of the statues along the way. This is not an accessible route and there is no way for wheelchairs or baby buggies to reach the monastery. Outside the exit, turn left and take the walkway over the road. At the end turn right down the slope to the road. This goes past down past the village to the road. Walk along with the village houses on your left and the road and overpass on your right. At the first junction see you will see a very prominent sign for IKEA on the Home Centre building ahead. Cross the street towards IKEA but turn left and walk along the pavement with IKEA on your right. Take the first right turn into Sheung Wo Che Road. Walk along this short road with the Government offices on your left and green hills in front. At the end of the building, keep walking straight and there will be a yellow sign saying “The Shatin Ten Thousand Buddhas Monastery”. Turn left as indicated by the black arrow into the small path that runs down the side of the government offices building. After a few meters the chain-link-fence lined path has a Y junction, take the right fork. Sometimes there are street vendors here selling snacks, which is fine, but also sometimes fake monks so take care not to be fooled. Continue on a few more meters and you will see the first of the Golden Statues that line the stairway to the Monastery. Climb the 431 steps to reach the monastery itself. If starting elsewhere in Shatin simply follow signs for the MTR and use the instructions above once you have arrived there. There is another walking route, which is more interesting but a lot harder to follow. If you would like to take the chance of getting lost, or if getting lost is part of the fun, then follow these alternative steps. Use the instructions above until you are alongside the village houses and look out for the football ground on your left. Turn left into the small path before the football ground. Walk through the Pai Tau village, passing the small traditional buildings, keeping the tall fence of the football ground on your right. At the end of the path, at the corner of the football ground, there is a modern small house ahead of you with a wooden fence. Turn left here and go up some shallow steps that have a green handrailing on their right. 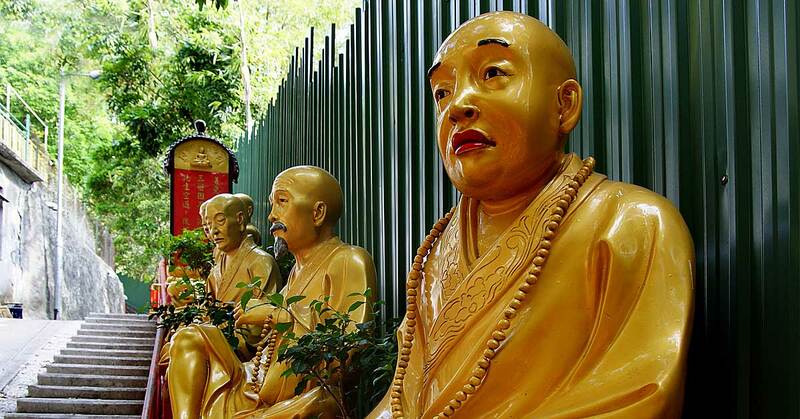 After about 10 meters there is a large white sign on your left that says “The Shatin Ten Thousand Buddhas Monastery”, which confirms you are on the right route. Climb the hill along a path that is lined with residential village houses, both modern and traditional. After 5 or ten minutes you will be able to see the Pagoda of the monastery ahead of you on the hillside. Aim at the pagoda to make sure you stay on the right path, except for one point where you have to turn right to cross a concrete tiny bridge with yellow handrails. After a while the path turns into steps, then you are about halfway there. Watch out for a yellow sign on your left, attached above the green handrailing, which directs you to take a turn to the right to continue with steps up to the monastery. The steps become even steeper at this point, and the view towards the right becomes even better as your altitude increases. Follow the yellow signposts which are now frequent, and when you see the stairs ahead of you straighten out with a seated Buddha visible at their top, then you are almost there. 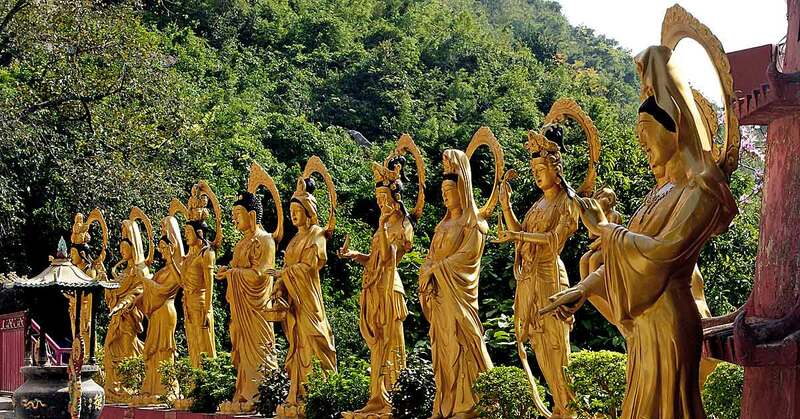 The last few meters of the path are flanked by statues of Arhats and finally, you reach a golden coloured gate through which you can see the Pagoda. This takes you to the first level of the monastery. The village walking path described here is more interesting but more confusing than the recommended path above. The monastery is open every day from 9 am until 5 pm, the restaurant closes at 5:30pm. It opens on public holidays including Chinese New Year, when many people will go to make offerings and ask for good luck in the coming year. If there is a No. 8 Typhoon signal hoised then the monastery will also be closed. This is a safety precaution because of the disasters that happened before with heavy rain caused landslips. There are no fees for entry to any part of the monastery. Donations are accepted but not in any way required. UPDATED 2018 : Sadly the restaurant is now closed and no longer serves food, only drinks are available. Below are details of how it used to be. The Ten Thousand Buddha Monastery Vegetarian Centre is a small vegetarian restaurant situated at the monastery, near where you first arrive. At this small eatery, you can sample some of the traditional foods eaten by Buddhists in Hong Kong. 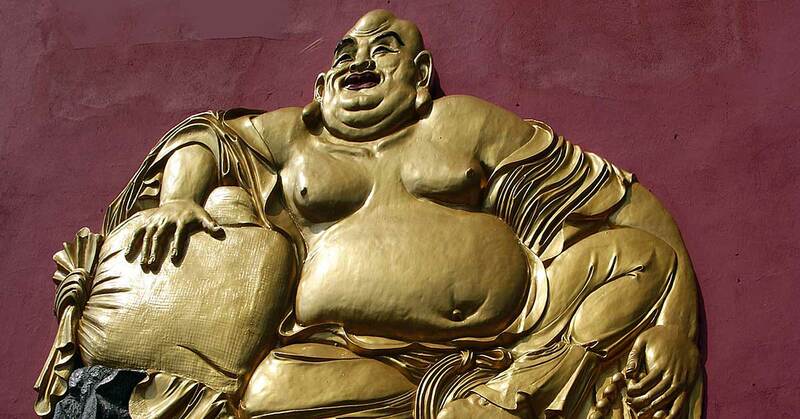 As the Buddha was against any cruelty to animals that means the foods are generally vegan. Although the decor and seating are decidedly basic, with Formica tables and cheap plastic stools, the great views of the countryside and the authenticity of the meals more than compensate for that. Each table has a steel pot on it holding chopsticks for you to use, and the tables are already laid with plastic bowls, spoons and cups. The atmosphere is of a village cafe or food hall in a working-class residential district. The dishes on offer are reasonably priced and offer a range of different things. There is everything from snacks and sweet soy products which would be eaten as a dessert, through to imitation meat dishes made from soy protein. Try the fried Singapore Noodles, a spicy but light lunch dish made with thick noodles, not the more common vermicelli used for Singapore noodles in other places. Also recommended are the Iced Grass Jelly snacks, a herbal desert. On the table, you will find the English and Chinese menu with these choices below. Main dishes are HK$60 each, which includes one bowl of rice. Each extra rice bowl is $5. Braised Assorted Mushrooms and Fungus with Vegetable! For snacks, you may choose from a variety of snacks such as Spring Rolls, Turnip cake slices (a favourite at New Year) and Fried Soya Bean Sheet Roll. Any two for H$16. Tea charges, which is a form of service charge common in HK restaurants, is HK$10 per person but only if you are eating snacks only. Those ordering full dishes do not have to pay any service charge. The restaurant closes at 5:30pm, half an hour after the main buildings of the monastery. Note that outside foods are not allowed in the whole of the monastery so eating and drinking is limited to this restaurant. Picnicking anywhere in the temple area is specifically prohibited. The monastery was originally intended to be just that, a monastery with monks. However that didn’t work out and so it became the current temple, pavilion and pagoda complex. Opened in 1957 the monastery was originally started in 1951 by the Venerable Yuet Kai who, working with the owner of a local tobacco company who was a Buddhist. Kan Yuk Kai, together with his brother Chiu-nam, started the Nanyang Brothers Tobacco in 1905 in Hong Kong and the next year launched the highly successful “Double Happiness” brand of cigarettes. As a devout Buddhist, he denoted large sums to disaster relief and other charitable causes. In the 1950s he agreed to donate land owned by the company on the side of a hill in Sha Tin for the project. Many of the Buddhists involved in the project, including the quite elderly Yuet Kai, worked on the project themselves in the tradition of earning Merit, by labouring to carry construction material up the hill. So when they say that Yuet Kai “built the monastery” this is a lot more literal than most statements that a king or emperor “built” a particular building. In the case of the Monastery, those involved literally used their hands to carry bricks up the hill. The funds for the project came from donations. Donations from many individuals lead to the construction of the monastery. Each donor is commemorated by the addition of a small Buddha status in the Great Hall or around the monastery. Arranged on shelves along the walls they create an impressive pattern that really emphasizes how many people contributed to the construction of the monastery. It is these mini Buddha statues arranged in ranks and files covering the walls that give the temple the name “Ten Thousand”, even though there are not literally that number. 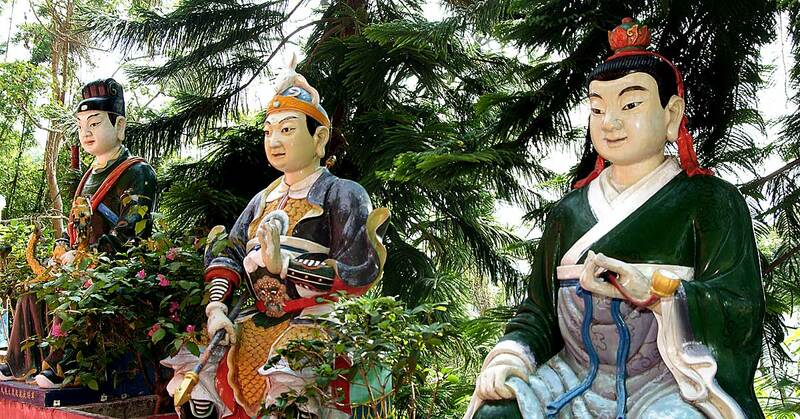 The naming of the temple as 萬佛寺 where 萬 means myriad, or commonly “Ten Thousand” has caused this misunderstanding, but now the name is well loved and there is a proud boast that in fact, more than 12,000 buddhas are to be found here. The Venerable Yuet Kai (月溪法師) was the Buddhist who founded the Monastery, coming to Hong Kong in 1933. He preached Buddhism in Hong Kong and gained the following of many people including Kan Yuk Kai who donated the land of the monastery. Yuet Kai died in 1965, eight years after the Monastery first opened. HIs incorruptible body, seated and covered in gold, is still on display at the monastery. Lining the 431 steps that lead from the street level up to the are rows of golden statues. 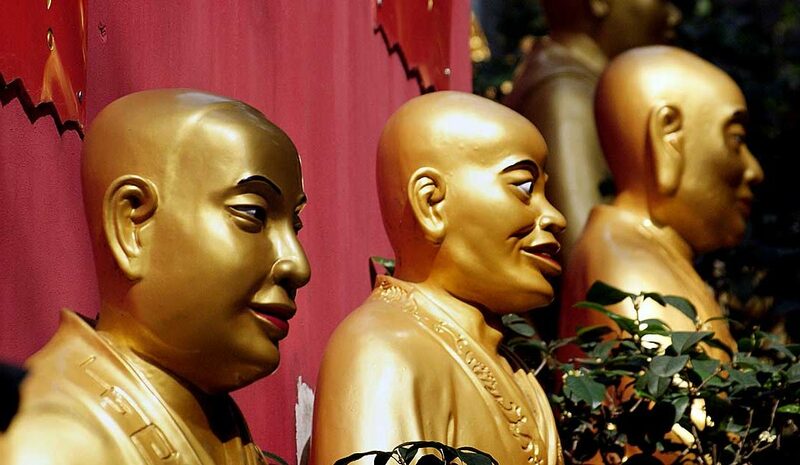 These are Arhat statues and are not part of the Buddhas at the monastery. 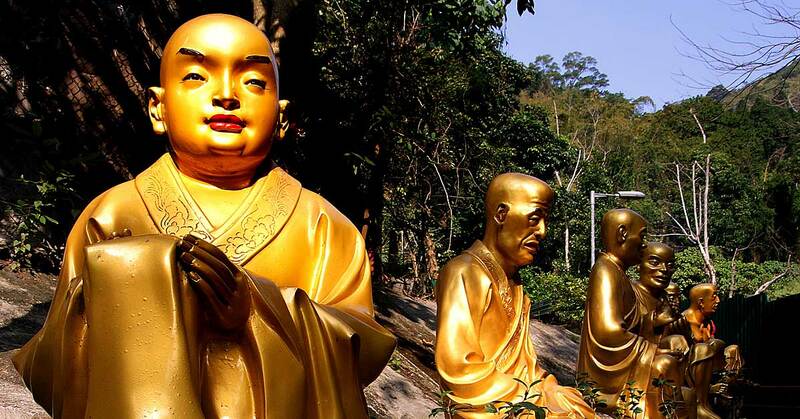 The individual statues each represent a different arhat, a venerated person in Buddhism, somewhat similar to a “Saint”. More of them are to be found all over the monastery, lining buildings outside the pagoda and placed on the hillside on the upper level near the terrapin ponds. Although everybody calls it a Monastery, this is not actually somewhere that monks live, unlike the Po Lin monastery in Lantau where there are monks in residence. Inside the temple, you will find places to make offerings, but there are no ordained persons living here. The name of the monastery is a total misnomer, not only is it not a monastery but there are not ten thousand buddhas there. That number comes from a mistranslation of the word 萬, which although has a literal meaning of ten thousand is more accurately translated as “myriad”. And like that word, it means both literally 10,000 and metaphorically “a very large number”. 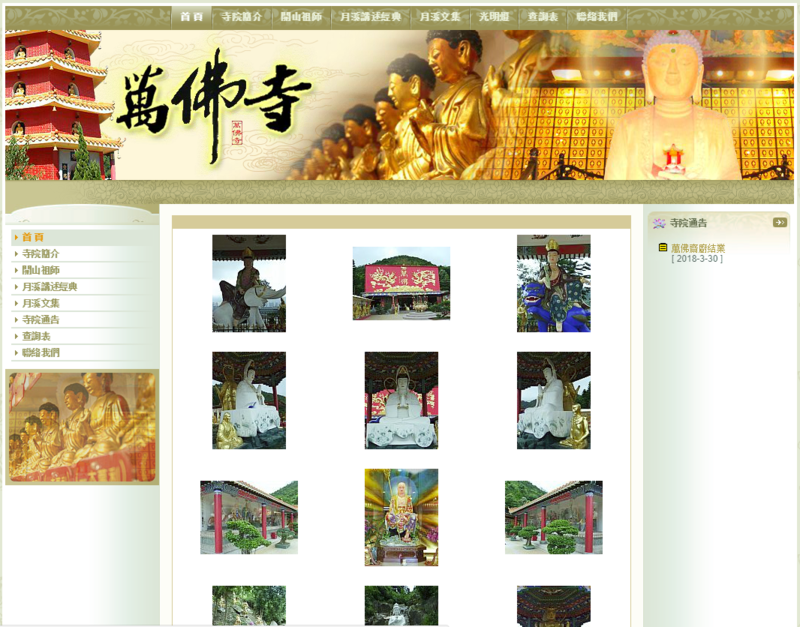 Understanding this the site would be more accurately named in English as “Myriad Buddhas Temple” rather than The 10,000 Buddhas Monastery, but now this name is so well know that even the organisers use it themselves, as in their website name which is “10K buddahs dot org”. People come to the monastery not just for sightseeing, and the vegetarian food, but also to worship at the some of the many altars there. 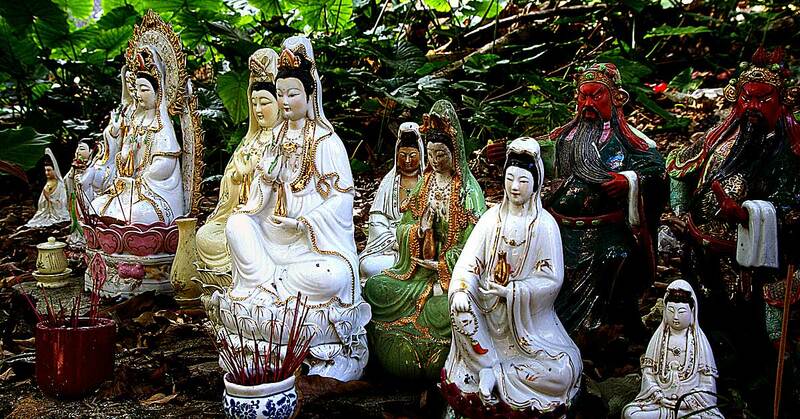 As well as statues of the Buddha there are many also of Kwun Yam (觀音), seen as the mother goddess of Hong Kong. Therefore people come here to pray, to make offerings and to light joss sticks and ask for good fortune in their lives. The monastery composed of a number of structures across two levels. Each one is large with many separate buildings, viewpoints and structures. There are also small areas above the main levels. When you arrive at the top of the steps on the recommended route, there is a large signboard pointing out the different things you can see in the various parts of the monastery complex. These are only the high points but they give you some an idea of how large the complex is. Turning right takes you to the upper level where you will find. A wide courtyard surrounds the pagoda and includes many pavilions including the Grand Hall with the large arrays of miniature Buddha statues. You will find the vegetarian restaurant and the pagoda on this level. 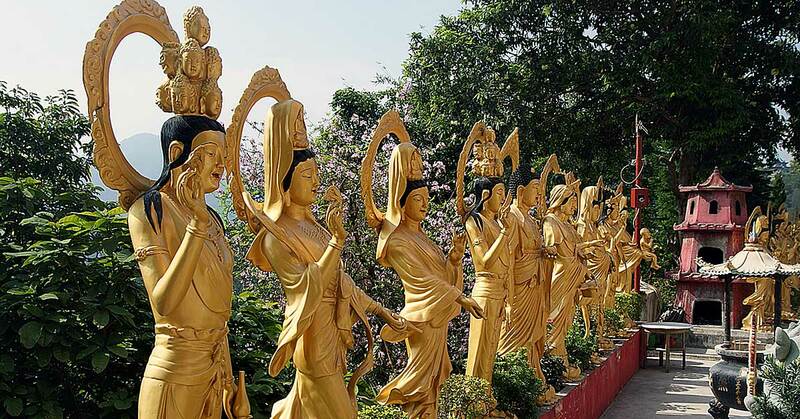 The upper level is reached by another long flight of stairs at the top of which are wide open spaces with great views of the surrounding countryside, as well as row upon row of golden statues of Kwun Yum in her many aspects. 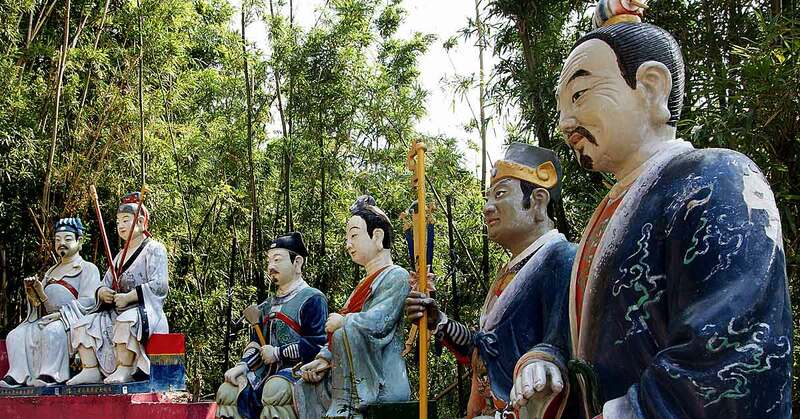 Inside the various buildings, you will find large painted statues to a variety of traditional Taoist deities, places to make offerings, and scenes from traditional stories. 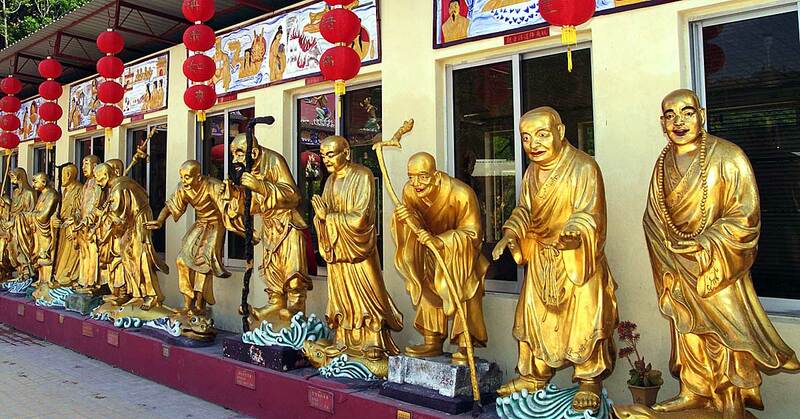 All the different statues have signs saying that they are, but the signs are almost exclusively in Chinese only so unless you can read Chinese, you will be guessing most of the time what they represent. The best viewpoints are at this level on a little bridge that juts out from the hillside, with a pond below on which with many terrapins. One higher level is home to another white statue with natural waterfall as a background. From the upper level, there is another flight of steps, again flanked by statues but this time of Kwun Hum, which takes you down to the main lower level again. The largest of the buildings of the monastery is the Grand Hall where the small Buddha statues are housed. This is the main temple of the complex and the one from which the name is derived. No photography is allowed in the main hall but you can see the huge displays of buddha statues lined up in ranks. People come here to make offerings and can be seen with paper offerings and joss sticks. There are many separate pavilions, each housing a particular statue. Most of them are open air with decorated roofs in a traditional Chinese style. The six sided Kwun Yum pavilion houses a large golden statue of Kwun Yum wearing white robes. This is one of the most popular places to offer joss sticks as Kwun Yum is favoured by the people of Hong Kong. The pavilion is centrally located on the upper level and is one of the largest. Monkeys – macaques, including some rare albino ones, are to be found living near the monastery. Don’t feed them or encourage them as it is bad for their health. 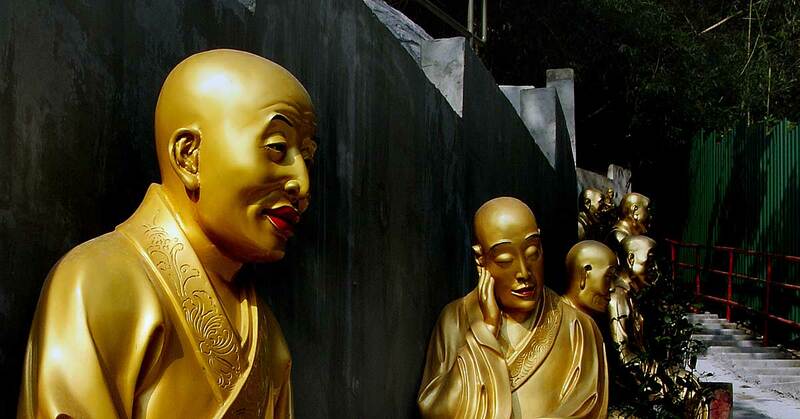 The caretakers at the monastery discourage them but of course, being buddhists would never do anything to harm them. Heavy rain – the monastery closes if the rain is too heavy, but even mild rain does make everything very slippery and with all the steps at this site it is best if care is taken and good shoes worn. 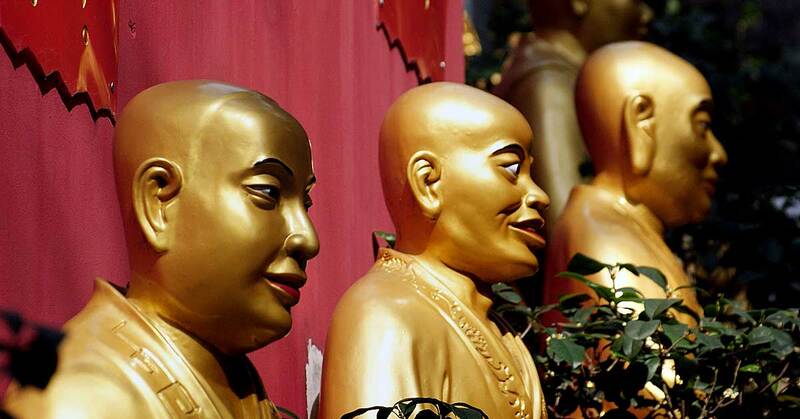 Fake monks – sadly people pretend to be monks in order to get money. Mosquitos – being right in the countryside there are plentiful mosquitos here, so a repellant would be a good idea. Smoking is not permitted anywhere in the monastery complex. 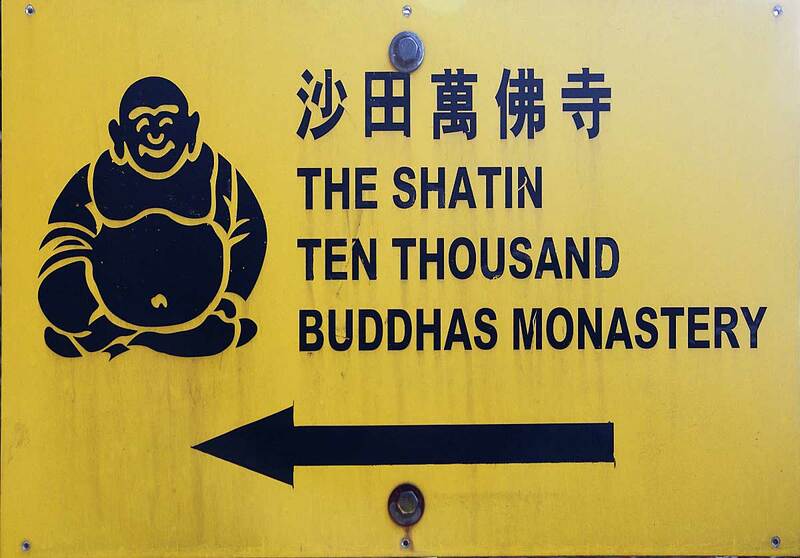 Unfortunately, there is a problem in Hong Kong with “Fake monks”, and you will find them loitering at the base of the path that leads up to the monastery. 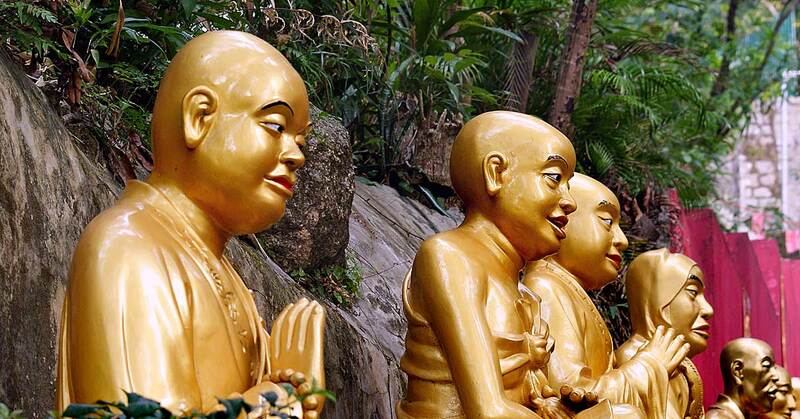 These people are in no way related to the real monks. Just because a perosn wears monks robes does not make him a monk. And real buddhist monks will not try to ask for offerings in the street in Hong Kong. The official website of the monastery provides plenty of more detail, but in Chinese and is hard to read on a mobile phone. You can also call to make enquiries at the Hong Kong number : 26911067 or email them at [email protected].org. Hong Kong Heritage Museum – A large and well organised, if rather out of the way, display of the heritage of Hong Kong. Shatin Park and River – A nice park stretches along the south bank of the river, and you may walk through this from the MTR station to the heritage museum. You’ll find small ponds and Chinese style gardens in the park that are picturesque and more sedate than the structures at the monastery. Shatin Racecourse – One of two racecourses in Hong Kong, this is a must see if you have an interest in racing but is otherwise a miss.